Cut out the chicken's comb using a template onto a white piece of paper. Using the paper template, cut two of these from red felt. Pin the felt pieces together and stuff with polyfill. Hand stitch the two red pieces of felt together around the polyfill. Using big stitches, hand stitch the red comb to the very top of the white cap, near the seam. Pin white feather boas around the knit cap, starting at the comb and moving down the hat. 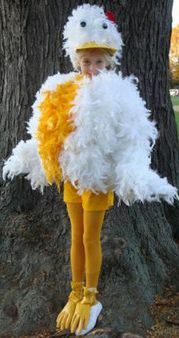 Cut a chicken beak out of golden yellow foam, and glue it to the underside of the feathered cap. Glue big, googly eyes to each Styrofoam ball. Glue the Styrofoam balls to the center front of the feather cap, above the beak. Pin the bottom of the t-shirt to the inside middle of the sweatshirt using safety pins. Add stuffing between the t-shirt and sweatshirt to make the chicken's body fluffy. Pin the gold or yellow feather boa up and down the middle-front of the sweatshirt twice. Pin the white feather boas to the sweatshirt so they surround the yellow boa on the front. Pin white feather boas up and down the back of the sweatshirt until it is completely covered. Then, pin white feather boas up and down each sleeve. Gather any fallen feathers from the boas and glue them to the back of the white stretch gloves. Stuff a pair of rubber dishwashing gloves with newspaper, carefully filling each finger. Spray paint each stuffed glove a golden-yellow color. Let the paint dry. Loosely pin the stuffed, painted dishwashing gloves to each shoe using one to two safety pins. For a more secure fit, cut a slit in the back bottom of the glove to allow the child's foot to fit through the glove and into the shoe. Wrap a rubber band around the child's leg to hold the top of the rubber glove in place. Dress up in the stuffed feather sweatshirt, feathered gloves, cap and shoes. For the pants, one can wear gold sweatpants or shorts and tights. As an added accessory, carry a KFC bucket as a trick or treat pail.